THIS IS A LISTING FOR 1 PAIR. The pearl dangle earrings are made with 8mm off white perfect round Swarovski pearls, sterling silver pins and sterling silver French earring hooks. All metal is guaranteed sterling silver made in the USA. This listing is for the 8mm normal sized pearl dangles. They are the pair in the RIGHT of the 2nd and 3rd picture. The pearl dangle earrings come in a natural gift box, with a personalized scalloped gift tag in ivory. The gift tag has scalloped edges with an antiqued look. Every gift tag is made by myself and a little rhinestone is handplaced in the middle. or any other text with a maximum of 40 characters including spaces. My pearls are known for their quality and incredible lustre. NEED MORE OR LESS FOR YOUR BRIDESMAIDS? A perfect addition to every womans fine jewelry collection. Perfect for those occasions that call for subtle elegance. These make the most beautiful accent to your wedding attire, adding just the right touch of sophistication and grace. 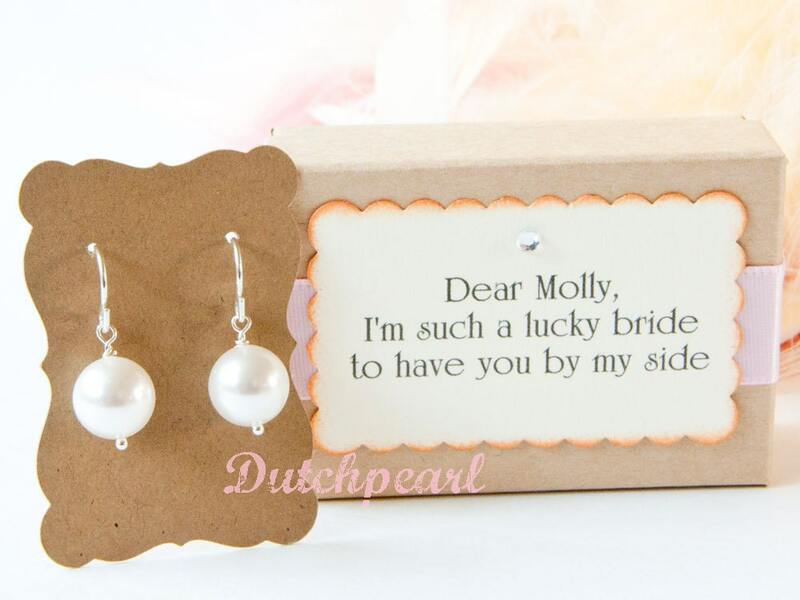 They make a wonderful gift for your bridesmaids to treasure, a beautiful gift for anniversary, graduation, birthday, or other important occasion. I bought this for my little who is graduating high school this year. Product is exactly like described and pictured and it looks awesome. Ordered this for my friend who is graduating college. It is absolutely perfect and she will love it! Highly recommend this bracelet! And it's a great price as well!